Tonight Sarah and I helped out at Leeds With The Homeless. We were both quite nervous of what would happen and of the people, volunteers and the homeless, that we would meet. But it was an incredible experience and we were made to feel very welcome and useful by everyone. Sarah had made a corned beef hash pie and cooked it in advance. She then put three cans of mushy peas into a flask and off we toddled to Leeds in the snow. We kept the food warm by wrapping it in some sweaters and fleeces we were also taking along. We were not the only ones there for the first time and a married couple with three children and two twenty-something chaps, all also newbies, soon arrived. We were all shown the ropes by Kesh, Adil and Fatima and, along with the numerous other volunteers, set to in setting up the huge variety of food that had been brought. I confess to being very apprehensive. Why, I am not really sure. But I was. This fear was allayed when the time came to begin serving the food to the homeless. They all had the opportunity to be served a portion of each of the foods available and I admit to initially being surprised that they didn’t all want a bit of everything. Why would they though? After all, we all have food preferences, allergies or intolerances. Once the initial queue had been served, us volunteers took the remaining food around the tables, serving extra helpings to the homeless. This gave us the opportunity to chat with and spend a brief time with them. We were told at the start that, along with food and warm clothes and the chance to get out of the cold, the people we were there to help needed to feel “human” again. They need to feel part of society again, they need to feel that someone has taken the time to talk to them, to afford them the time of day and the chance to feel valued. The two chaps in today’s picture, Manuel and Nick, are two of the most polite and engaging men I’ve met in a long time. Sure, they are both vulnerable and both obviously have reasons and histories that mean they attend “soup kitchens” such as this. We chatted for just a short while, ten, maybe fifteen minutes only. Manuel was keen for me to fill his little container with stew for him to share later with some of his friends who couldn’t attend. But, to only fill it after I had gone around the room and ensured everyone who wanted stew had got their fill. I will not pretend to understanding even the tiniest part of what these two chaps endure each day as they survive on the streets. I cannot comprehend how someone’s life can reach the stage where they are reliant on the help of “do gooders” such as myself. And I cannot say if the actions of Sarah, the other volunteers or myself will stay with Manuel, Nick and their homeless companions. I can say, though, that they will stay with me. 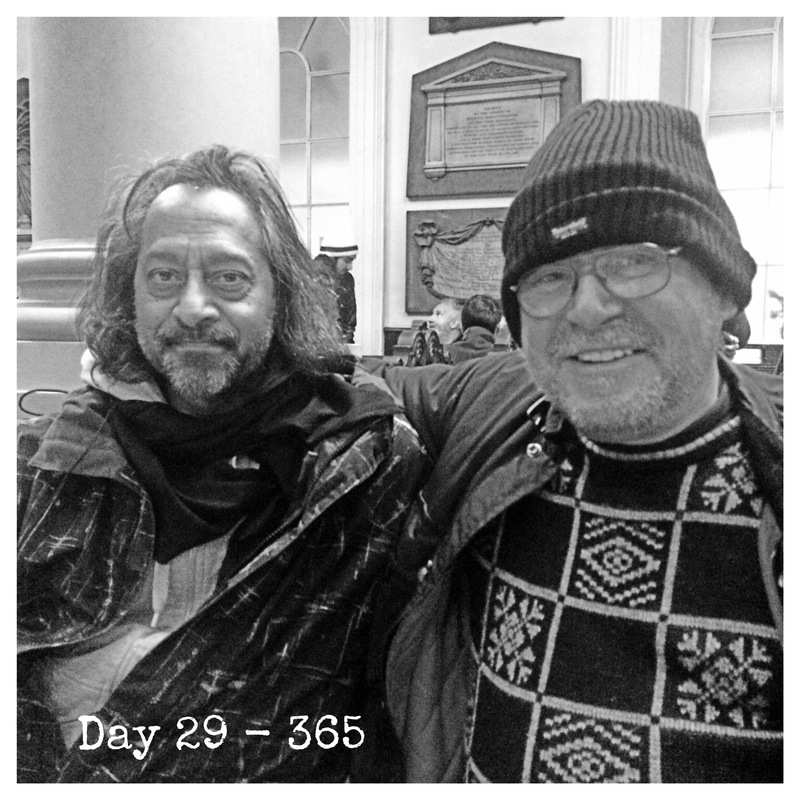 Leeds With The Homeless operates on the last Friday of each month; although tonight was brought forward a day because the venue, St. Trinity Church, is booked tomorrow. I aim to help out each month that I can. After all, what does a few ingredients, a few hours of my month and a few brief conversations and kind words cost me? Nothing compared to what it brings to others.